The P wave on an ECG is a measure of atrial electric function, and its characteristics may serve as predictors for atrial arrhythmias. Increased mean P-wave duration and P-wave terminal force traditionally have been used as markers for left atrial enlargement, and both have been associated with increased risk of atrial fibrillation. 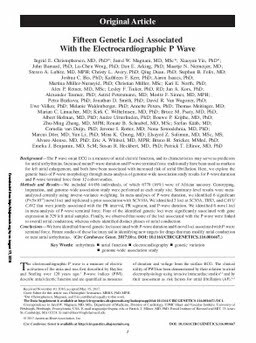 Here, we explore the genetic basis of P-wave morphology through meta-analysis of genome-wide association study results for P-wave duration and P-wave terminal force from 12 cohort studies. Methods and Results - We included 44 456 individuals, of which 6778 (16%) were of African ancestry. Genotyping, imputation, and genome-wide association study were performed at each study site. Summary-level results were meta-analyzed centrally using inverse-variance weighting. In meta-analyses of P-wave duration, we identified 6 significant (P<5×10-8) novel loci and replicated a prior association with SCN10A. We identified 3 loci at SCN5A, TBX5, and CAV1/CAV2 that were jointly associated with the PR interval, PR segment, and P-wave duration. We identified 6 novel loci in meta-analysis of P-wave terminal force. Four of the identified genetic loci were significantly associated with gene expression in 329 left atrial samples. Finally, we observed that some of the loci associated with the P wave were linked to overall atrial conduction, whereas others identified distinct phases of atrial conduction. Conclusions - We have identified 6 novel genetic loci associated with P-wave duration and 6 novel loci associated with P-wave terminal force. Future studies of these loci may aid in identifying new targets for drugs that may modify atrial conduction or treat atrial arrhythmias.